Complete list of Sheet Music Selections on this CD. This CD contains complete solo piano music of Grieg and Mendelssohn. All of the Lyric Pieces, Songs Without Words, Sonatas, Concertos, Peer Gynt Suite (2 versions), and all the 4-hand music - over 1600 pages of sheet music. Edvard Grieg was born in Bergen, Norway, in 1843 and died in Bergen in 1903. Felix Mendelssohn was born in Hamburg in 1809 and died in Leipzig in 1847. PUBLIC DOMAIN STATUS: Copyright dates and publisher information have been removed from all of the selections on this CD. A letter is included on the CD which states in part ". . . the files are derived from public domain music in editions that are in the public domain." The publisher has stated that they have paid no royalties to reproduce any of the music, and that all included sheet music is in the public domain in the USA. 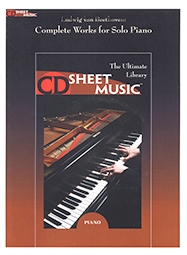 ABOUT CD SHEET MUSIC In order to install the CD Sheet Music software you have to agree to not copy the CD and that you accept the usual small print typical to all software. But once installed you can print as many copies as you like of any piece any time you need them. You can print this sample page and see that it is easily readable and playable. What is a Sheet Music Reprint? © 2019 Haven Sound, Inc.